A gem among our accommodations, that’s how you may well describe this property. The authentic character has been preserved through the stone and woodwork, but everything else is completely renewed. Almost all bedrooms have their own, newly built private bathroom. Three of these are located in a separate wing of the house, the other in the part where the living room and other amenities are locates. And what about the spa facilities? 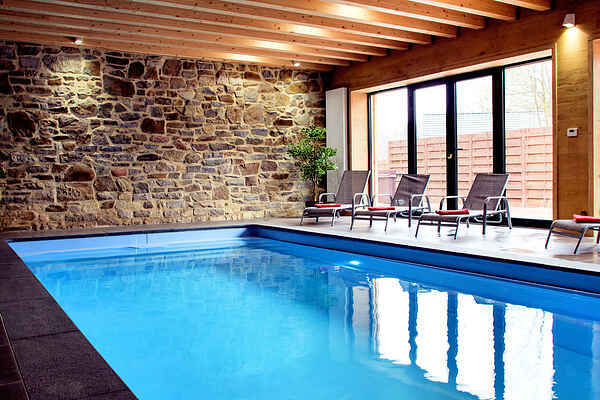 Both during warm and cold weather, the indoor pool is at your disposal. In the next room, where the spacious sauna is located, you imagine yourself in a massage parlor and outside, on the terrace, a jacuzzi awaits you. Everything in the house emanates luxury and quality, and of groups that that want to experience the Ardennes in style, this is the ideal destination. During summer, there is also still plenty of space to sit outside and enjoy the nice weather. A stone's throw away is the lake of Robertville where there recreational possibilities. Other nice places like Malmedy and German Monschau are also a short distance away. But in all honesty, in a house like this you may not want to leave at all. During the summer, the property is decorated with flowers in hanging baskets and during the winter, with Christmas decorations.